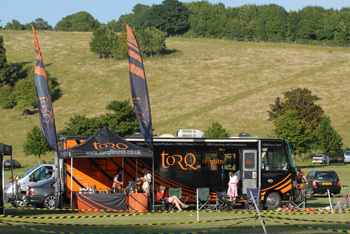 TORQ have been driving miles around the UK in the distinct TORQ RV or sometimes just pitching up the ‘dash and go’ TORQ ‘car and trailer’ display at various events, dishing out advice and tips to riders across the UK, along with the occasional cup of tea. You’ll always know where the TORQ stand is, it’s the one with masses of people swarming around sampling the delights and stocking up on tasty products. 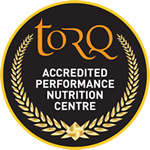 TORQ – it is more of a lifestyle than just a business…. 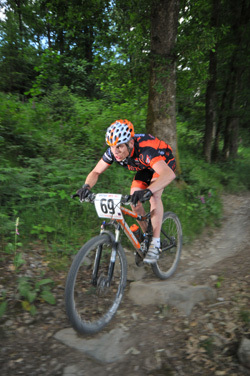 Anyway we digress and moving on, we’re into June where our TORQ sponsored athletes once more shone. 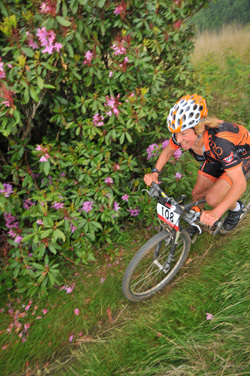 First up and it was the National Marathon Champs held in one of the UK’s best loved venues – Margam Park, South Wales. 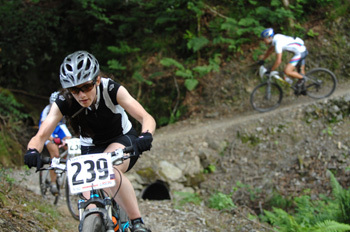 Split into various distances, the actual National titles were only up for grabs in the 100km, but for hundreds of other rider, they had the opportunity to come along and ride in either the 50km or the 25km at the same time, rubbing shouders with the best in the UK. 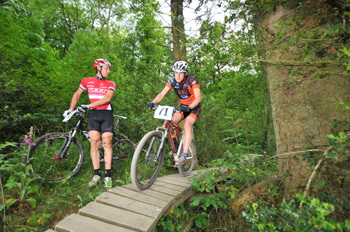 In action and sporting the TORQ colours for the 100km event were Matt Loake, Charles Newton-Mason, Lydia Gould and Emma Bradley. Lydia flashing past the flowers. 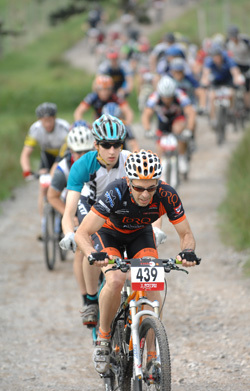 At 25km per loop, the Margam course is one of the longest laps over some of the toughest climbs you can imagine. Constantly climbing and descending, with the final climb giving you an outstanding view of the surrounding area (and Port Talbot Steelworks) before a rapid descent and long chase home across the open land, dodging herds of deer, before heading out once more. Added to the toughness of the terrain was some blindingly good weather, which after some of the washed out events that have happened this year was a sort of blessing…. 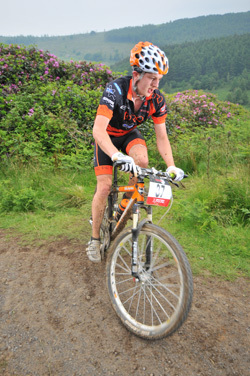 Best finisher for TORQ was youngster Charles coming home in 23rd position with a slightly older (only just) Matt coming home in 25th spot. Lydia very nearly made it to the podium in the women’s event coming home in a respectable 6th spot, but Emma had to abandon her race after just 2 laps, which was a big disappointment for her. 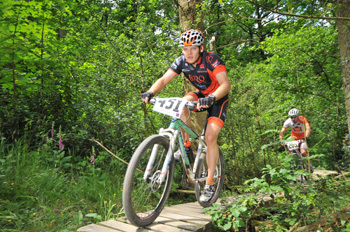 In the sporting races, TORQ were much more prominent on the podium with vet riders James D’Arcy & Rob Barker picking up 1st and 3rd respectively in the vets 50km, While James’s wife Amanda picked up a silver in the women’s vet 50 km to make it a complete collection for the team. June was also the month that World Cup fever hit the UK, with the annual triple header (DH/4X & XC) hitting Fort William and so the annual pilgrimage to Scotland for round 5 of this global series was under taken to see the Worlds best in action and hope that some of our own grown talent would pull out all the stops and take a win or two. We were richly rewarded in the downhill, where UK riders have excelled over the last couple of years, with Gee Atherton narrowly missing out on the top spot picking up 2nd and the legend that is Steve Peat taking 4th. 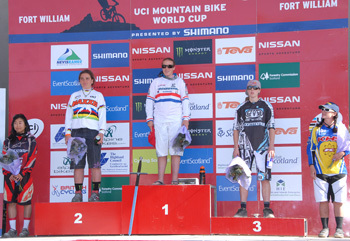 In the Women’s DH it was Tracy Moseley, a TORQ supported athlete that took a fine win. After a disappointing World Champs the previous year, this was a much welcome win in front of a home crowd and as she went to receive her trophy, her Torq bottle went too!!! 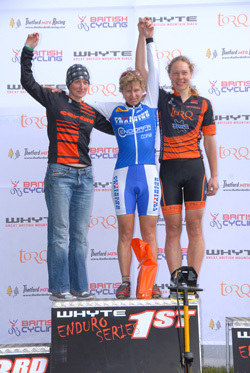 Tracy on the top step along with her Torq bottle! 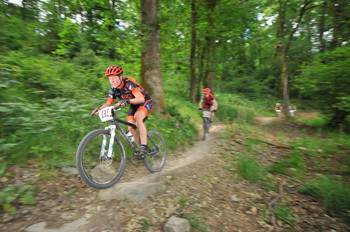 In the XC another TORQ supported athlete was having the ride of her life. 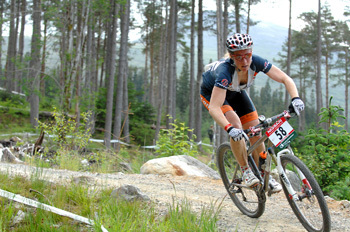 Kate Potter on her continuing journey on the World Cup circuit had her best result yet picking up a fine 33rd place. “I felt like I was pacing myself well and towards the end of the race started to make up a lot more places to move into 33rd position.  I was very happy with my result, but more importantly I really enjoyed hearing all the encouragement from the crowd, who made me feel like I was racing on home turf, which in many ways I was.” To find out how she got on pop over to her blog where she goes into great detail! The rest of the TORQ honour was upheld in the Elite race with Nick Collins picking up 14th, and Phil Coad finishing in 20th spot just one ahead of Torq supported rider Ross Adams. Dan Booth looks on as Phil Coad rides for home. In the women’s elite race, all eyes were on Kate Potter, fresh from her World Cup exploits, and riding her first NPS of the season. Other money was on Sue Clarke, local to the area and with her form now coming on pretty strong. However her challenge was quickly dashed after a series of punctures and a set of broken bars. 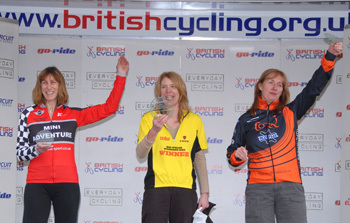 Despite not feeling in top form Kate soon made short work of her competition to take a cracking win. 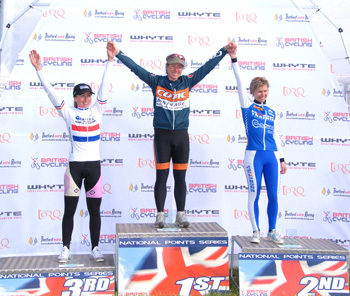 Also Keeping the TORQ flag flying high was Mel Spath who finished 4th in the Elite race While Viv Hazleton took a step on the podium to taking 2nd in the Grand Vet women’s race. 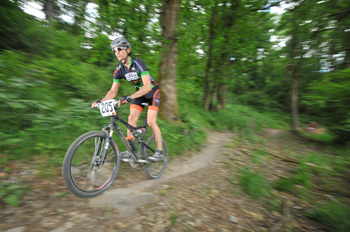 In the men’s Expert race, Eric Pettit, (the perpetual student!) 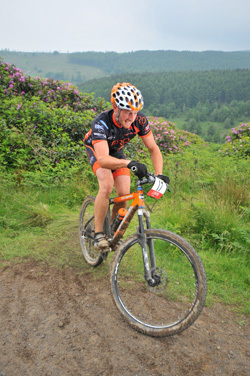 finished 14th with Steve Shaw gradually getting back on form after a long lay off due to illness finished 21st. 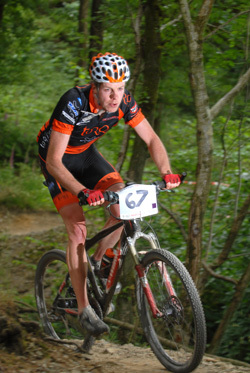 John Richardson also riding for TORQ supported Leeds Uni, took a break from his exams to finish 14th in the sports race, while Emma Bradley took 4th in the women’s masters race. Sunday and the sun was still shining and the midges still biting and now it was time for the enduro riders to get stuck in. Mel after a strong ride yesterday, picked up a great second in the 100km with Emma picking 4th. 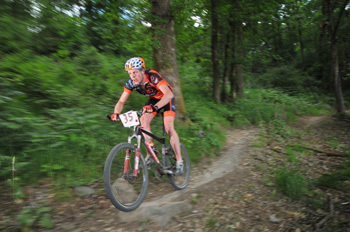 Torq got yet another podium position as Ryan also took 2nd in the men’s 100km, while team boss Matt Hart abandoned duties at Torq base camp leaving wife Sascha to hold the fort while he went off to compete in the 75km, where he came home in a creditable 5th spot, with Steve Shaw taking 16th. So the trip to Grizedale for all was well worthwhile despite the numerous punctures and the dodgy moment for Matt and Sascha as they tried to maneuver the TORQ car and trailer sideways…. 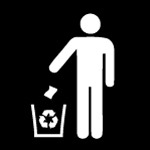 but thats another story! 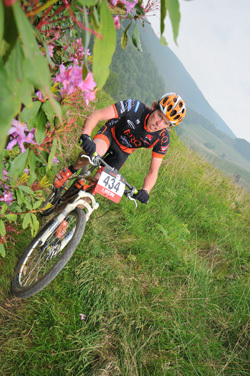 And June continued in a similar theme with Mountain Mayhem another successful TORQ presence both on site and on the podium. But you’ll have to wait a bit longer for that report… Keep checking back to find out how we got on. 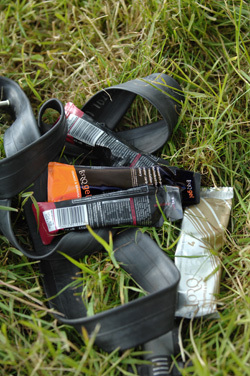 Essential kit for surviving Grizedale.